We offer Laser Tattoo Removal and Laser Skin Treatments at Alan’s Cool Ink, in a private consultation and treatment room. Free Consultations are by appointment only so please call ahead of time at 850-650-6334 for scheduling. The use of lasers to remove tattoos has developed significantly in recent years. We’re equipped with the most modern technology, providing safe and effective treatment for our clients. A beam of laser light shatters particles of ink pigment into small pieces. Over a period of six weeks after treatment, the white blood cells carry away these particles. The treatment does not cut or burn. The effect you get after each treatment is that more and more of the tattoo fades away until finally it is gone completely. The final results are excellent as can be seen in the photographs. However, the skin may not be instantly perfect because it has been traumatized by the treatment. A faint shadow may result until the melanin in the skin returns to normal. Most patients say it is like having a tattoo put on. Others say it is similar to having a rubber band snapped at the skin. Any discomfort stops as soon as the laser does. How long does each laser tattoo removal treatment take? It depends upon the size and number of tattoos, but an average tattoo will take around 10 minutes to treat at each session. How many treatments does it take to remove the tattoo? It depends on each tattoo and each individual. Amateur tattoos take an average of four treatments and professional tattoos take about eight, leaving six weeks in between each treatment to allow time for the white blood cells to dispose of the broken down particles. What are the alternatives to laser tattoo removal? Skin Grafting – expensive, painful, donor area required, obvious scars. Plastic Surgery – expensive, painful, high degree of scarring and stretch marks. Co2 Laser – expensive, painful, high degree of scarring. Dermabrasion – expensive, painful, high degree of scarring. The treatment certainly costs less than any other forms of removal. Please meet with our consultant to receive pricing specific to your needs as each case is different. We’ve added the Zimmer Cyro 5 Chiller to our equipment line up and you are going to LOVE US for it! Curious to what it does? 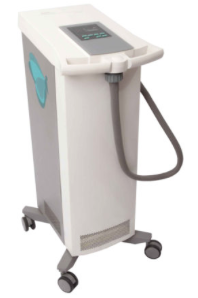 The Zimmer Cryo 5 cooler minimizes pain and thermal injury during laser and IPL treatments, and provides temporary relief for cosmetic injections. Unlike other cooling methods, such as contact cooling, cryogen spray, or ice packs, the Zimmer Cryo 5 can cool the epidermis before, during, and after any non-invasive laser or IPL treatment. Rather than undergoing costly, painful, and dangerous surgeries, or going on many diets that just do not work, clients who are looking to lose fat fast can undergo this non-invasive and efficient procedure. Using powerful fractional laser technology,without harming the surrounding skin, laser scar removal is a non-invasive, advanced approach to scar treatment that offers excellent results without the discomfort and downtime of surgery. Can’t get rid of those last few inches? Problem area giving you PROBLEMS? Using laser energy, radiofrequency, ultrasound or cold (cryolipolysis) to reduce fat, say goodbye to those stubborn fatty areas. A safe, very effective, non-surgical alternative to Liposuction. This revolutionary technology combines ultrasound, radio frequency and vacuum therapy for a highly potent body sculpting treatment. If aging, acne, or too much sun has left your face with blotches, scars, wrinkles, or lines, skin rejuvenation may help. The goal of laser skin rejuvenation is simple: replace damaged skin with new, fresh skin.